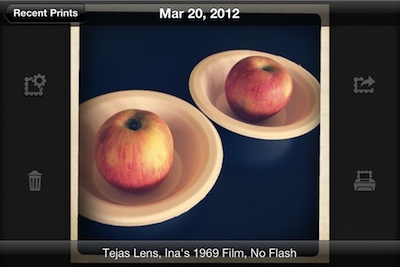 Hipstamatic Camera for iPhone updated – it’s all about sharing, even directly to Instagram! 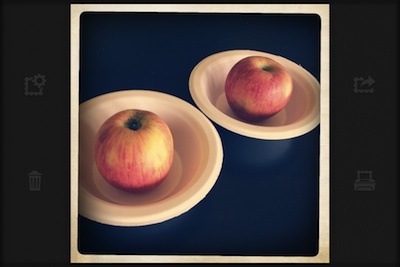 The Hipstamatic retro camera app was updated today… not with new lenses or new retro film, rather a whole new image interface that includes more ways of sharing your snapshots. Normally, you snap a photo, wait a while, go the photo area, tap an image and are taken to a spot in Hipstamatic with a small view of the image and a scrolling list on the right that has lens/film info and share with a couple services. Now, the area of your photos is the same, then everything after that has changed. Choose a image to look at it. 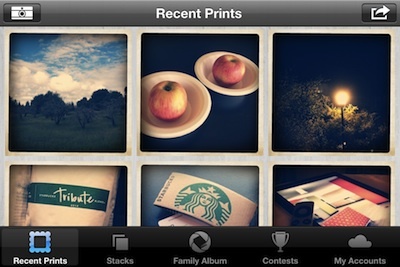 or choose the ‘Share’ button in the upper right corner for the ability to select multiple images. 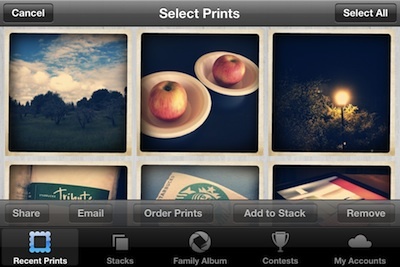 In the ‘share’ area of Hipstamatic, after you select the images you wish to take an action on, then use the buttons along the bottom to process. Share through a social service, attache to an email, order prints to be sent to you, add to another customized photo area or delete. Selecting one or many, then Share take you to a new screen for entering text and selecting what social service you which to send your Hipstamatic camera photo(s) to. Notice that Instagram is one of the options now. There is a rumor that this is due to a special deal between the two companies, I have not been able to confirm yet. Enter your text, choose your service and hit the ‘Share’ button! 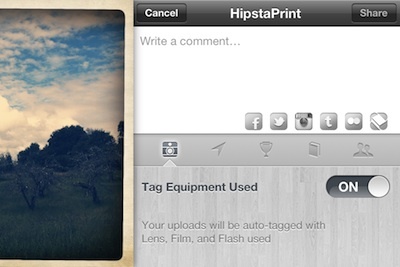 Instead of selecting the ‘share’ button, you can still tap on a single image in the Hipstamatic photo library. Like before the update, this takes you to a view of just the one image. Now though, it’s is a full screen image with the four options buttons around the outer edge. The buttons are ‘more info’ and Trash on the left. On the right is share (like above) and print using the Hipstamatic supported professional printing services. Swiping across the image will let you cycle through the images available in that library. Tapping the screen and not one of the buttons brings up a boarder expelling the camera set up that the picture was taken with. 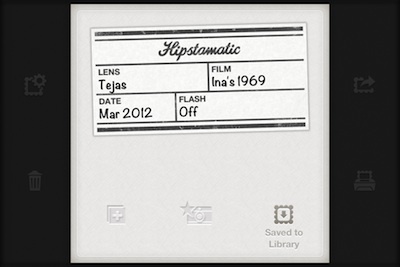 As well, the button to go back to the image library overview screen.